If airline travel wasn't scary enough, the Transportation Safety Administration issued its latest alert yesterday, warning travelers about people practicing yoga in airports. 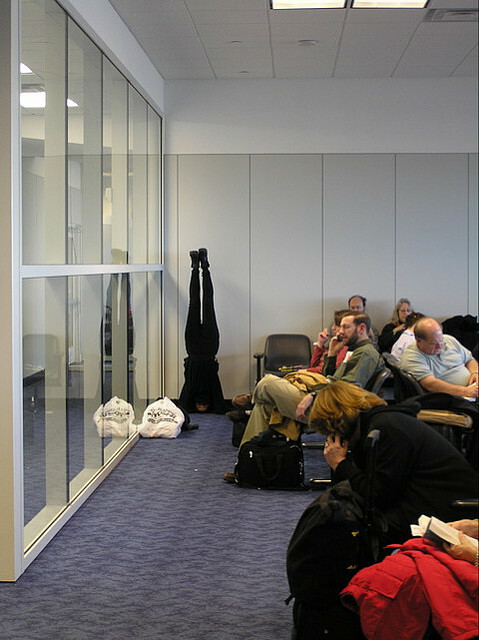 In an attempt to stem the increasing public displays of yoga in airports, the TSA have begun deploying special behavior screeners, trained in various yoga styles to spot people who seem prone to acting out with yoga poses. 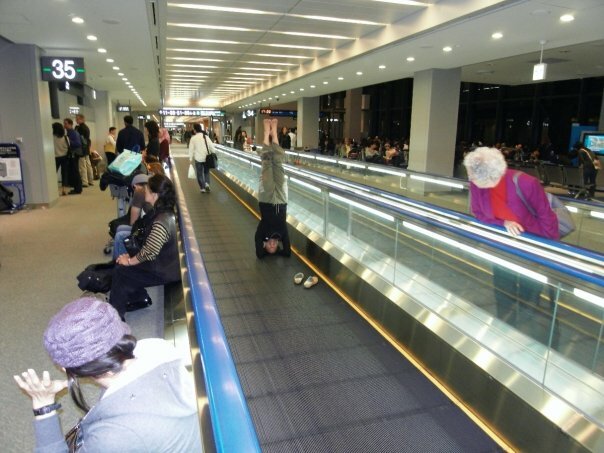 This crackdown has been in response to numerous complaints from airline travelers. Recently a woman who looked like any other traveler caught the attention of yoga behavior screeners as she stood in line at Kennedy Airport. “It was something about the way she was standing,” explained Ben Henry, a supervisor. She was standing on her head. The woman was questioned, every inch of her body scanned twice with a metal-detecting wand and her carry-on bag examined. Out came a yoga block, a yoga strap, sticks of incense, a vial of lavender message oil, a collection of mala beads, a bottle of Kumbuca, several Rodney Yee DVDs, a neti pot, a Krishna Das CD, a copy of My Third Eye Itches, a bag of Goji berries and a pair of ToeSox. They had found a yogi. 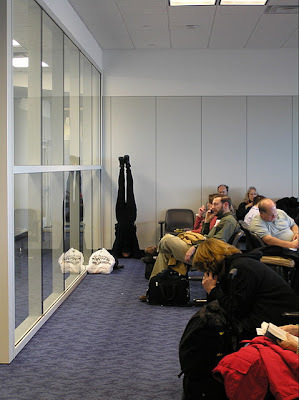 The screener warned the woman about practicing yoga in the airport and sent her on her way. TSA officials refuse to say exactly what sort of behavior can make them suspicious, but part of the effort relies on watching for inappropriate smiles or grins, beatific facial expressions, closed eyes, silent chanting, quietly mouthing Om, sitting cross legged, standing on one leg or weird methods of stretching. Many airline passengers are applauding this new crackdown on displays of yoga in airports. Virginia Randall, who was eating from a jumbo snack food bag and drinking a Big Gulp, stopped long enough to explain her irritation with these people. “Do I need to be subjected that crap. It’s bad enough that they are all thin, flexible and contorting themselves into demonic poses, but do they have to do that in the middle of the seating area? My God, enough already,” she exploded while dramatically jabbing the air with a half eaten Cheese-O. “If I did that kind of stuff, my husband would leave me…wait, now where the hell did he run off to?,” she asked as she looked around for her husband. Another airline traveler, Carrie Woodman, remarked how aggressive these yogis seem to be. “They are just like those Hare Krishna people that used to hang out in airports years ago,” she explained. “I can deal with the inconvenience of taking my shoes off, being strip searched or even having to deal with crying babies and cell phone users on planes, but these yoga people are the worse. I’m glad the TSA is cracking down on them. Who need that show-off stuff? Next thing you know they’ll be doing yoga in the plane,” she added.